$9.89 This item is selling for $9.89 on eBay. Top-Rated SellerSerendipitySales consistently earns high ratings from buyers thanks to fast shipping and excellent service. I will accept items for return. Restocking fee of 15% applies (as my items have free shipping – it is not “free” for me). I will refund your PayPal account or exchange (previous arrangments required for exchanges). Buyer is responsible for retun shipping unless there was an error or item was not as described. 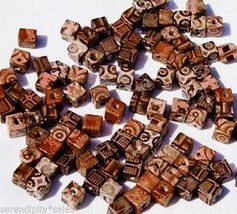 300 BAMBOO BEADS 10mm Cubes Cube shape beads - 10mm in size (slightly larger than 3/8") Assorted designs. Large holes (2-3mm) to make it easy for your jewelry projects. Bamboo grass is actually stronger than wood, so makes surprisingly sturdy jewelry. Light weight as well. Delightful patterns and colors. Beautiful Natural Color Theme. I aim to take representational photos and provide accurate description. Check out my Store for More Beads, Bells, Crystals! I will gladly combine purchases on allsales ending within 10 days of each other for economical shipping. TERMS of SALE: Items will be shipped within 3 business days after reciept of cleared payment. FREE shipping, First Class Mail. Priority available for 5.50. I like to exchange positive feedback at the end of the transaction. THANKS for Looking!! Have Questions? Contact Me! Present your best items with Auctiva's FREE Scrolling Gallery.